With spring on its way, I just can't help but think about sewing pretty dresses. These are two 1950's designs I really like. Two designs from different sources which have some things in common. I've shown you this one before. 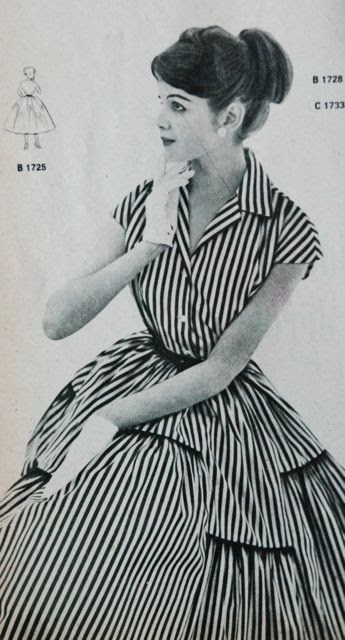 It was published in the French Elle magazine in the spring of 1955. I think it's great with the unusual skirt design and the clever use of the striped fabric. This is the other one. From the Dutch magazine Libelle, from the summer of 1956. Isn't that a brilliant skirt? 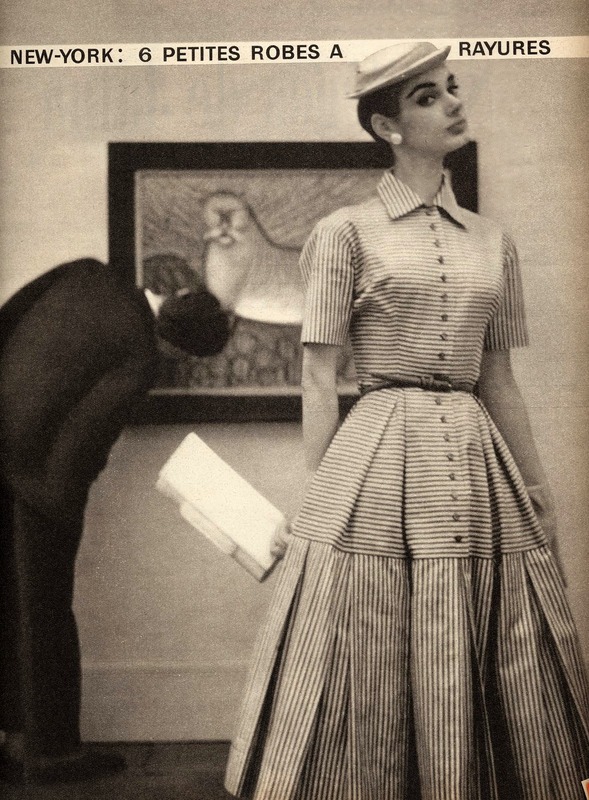 Both these striped dresses show very original variations of tiered skirts. Versions which should not be too difficult to replicate but still look fresh, original and unexpected. I'm normally not a particular fan of tiered skirts but I would love either or both of these. In fact, I consider making one of them my next project. I don't really have the perfect fabrics in stash but I have options. 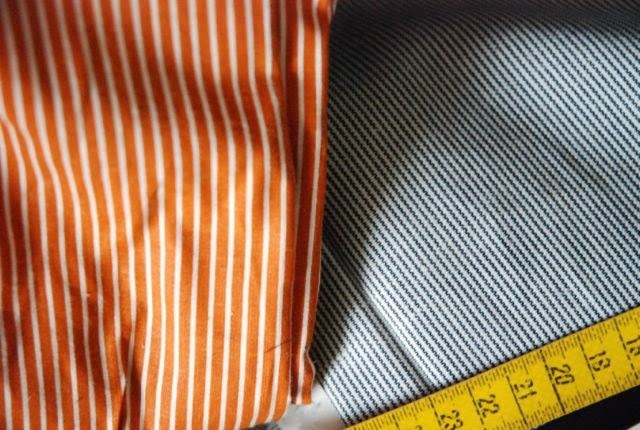 Last year, after I saw that first dress for the first time, I bought the orange striped cotton. The size of the stripe should work well for a design like this and the hand is fairly crisp which is necessary for those pleats. I'm not entirely sure about the colour on me though. The other design looks like it's made for a stripe as well. A bold black-and-white one. Colour might make the end result too cute. I don't have a boldly fabric but I have this finely striped stuff. This cotton is a bit thicker and has a bit more drape. Which is fine for this design. However, this is such a fine stripe that the fabric would look plain from a short distance. Which might be rather a waste of those cool spaced gathered bits. Of course, there is always the option of looking for new fabric but I am still trying to sew from stash as much as possible. What do you think? Which dress would you like to see, and do you think this fabric is right for it? Well, I absolutely love the orange stripe and think you would look great in it. The orange is calling you. I really love black and white stripes so I'd go with those - it is a shame that they aren't wider - but I don't think that design would lose anything by their subtlety; it's still a great unusual shape! My vote goes to Libelle dress. The skirt is very beautiful and elegant.